Every time I visit a new city, I make it a point to travel using the city’s public transport – be it metro, trams, buses or cable cars. Using a city’s public transport allows me travel like locals and discover the city from the local’s points of view. It also helps me understand how well a city is “connected“, and over time I have come to realise how a good public transport system is critical in every city. 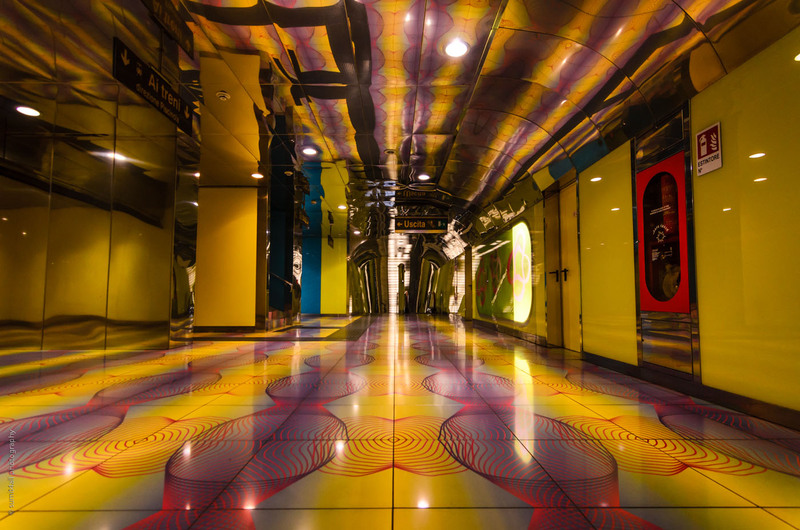 In Naples, while above the ground there was unexpected beauty in its raw and chaotic nature; below the ground the city transforms into a land of bright colours, reflections, and unbelievable art and design. I knew the Naples metro stations were beautiful before I arrived, but their beauty managed to surprise me even after knowing the fact. 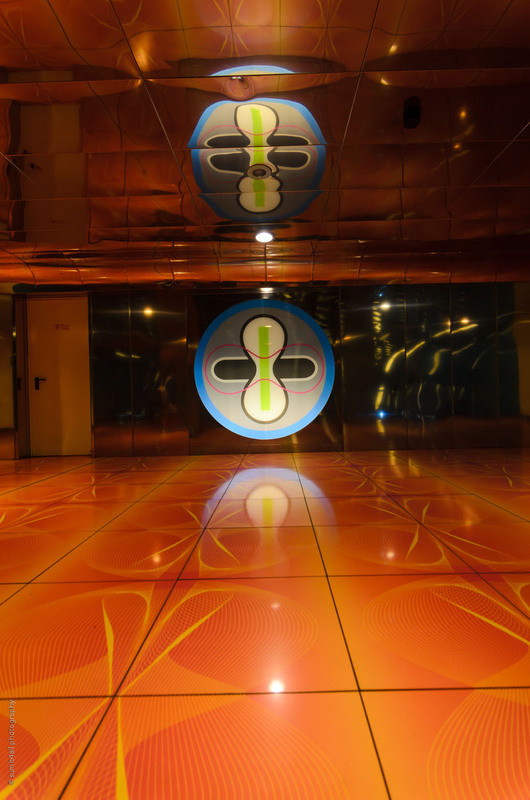 The Naples metro was a perfect amalgamation of the city’s past, present and future. And this photo essay attempts to capture and bring that to you – the viewer. The Naples Metro was originally planned decades ago by Lamont Young – a Naples born architect – and would have been the first subways in Italy. But the project never took off. Finally, with about 55 miles of rail lines linking the suburbs to the city-centre, the first railway lines opened in 1993. 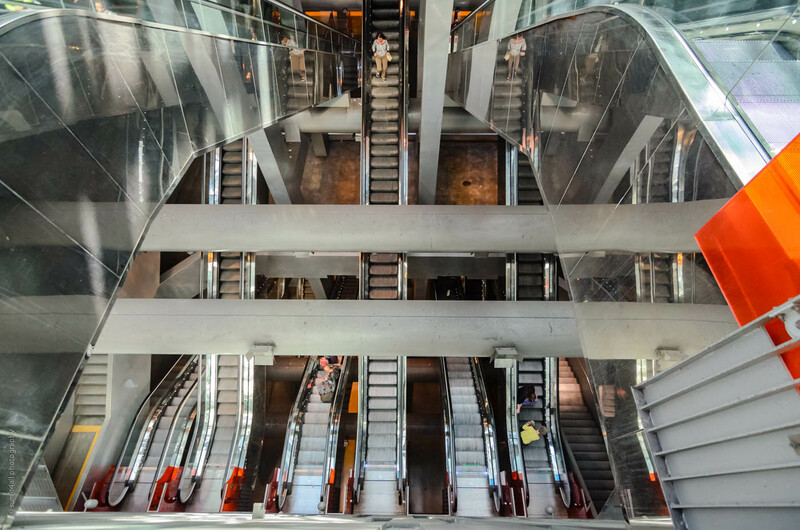 After almost a decade in 2003, the urban transport plan was brought about to change the face of the Neapolitan Metro to what it is today – a treasure trove of some of the best contemporary art installations. The Naples Metro comprises of 3 underground rapid transit lines. 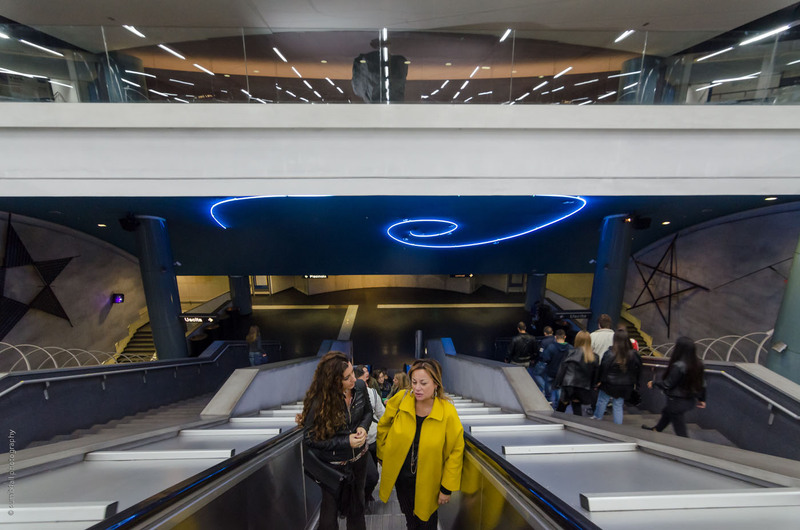 While line 1 has been renamed ‘Il Metrò dell’Arte’ (The Art Metro), with about 8 stations featuring art exhibits, plans are underway to open more stations along the same theme on the other lines as well. 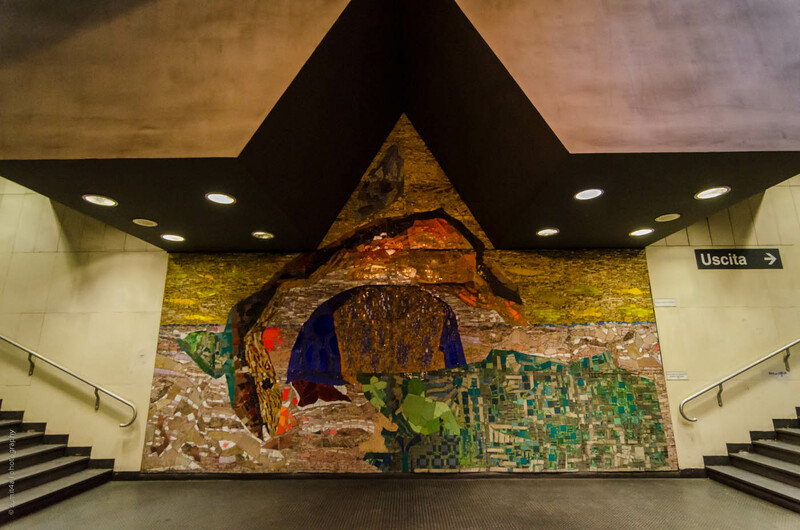 The architecture and the interior of the stations has been designed by architects like Gae Aulenti and the firm Atelier Mendini, Achille Bonto Oliva, Oscar Tusquets Blanca, Robert Wilson who designed the light panel seascape at the Toledo Station transforming them into museums of art. The Toledo Metro Station, Dante Metro Station, Salvator Metro Station, Universita Station, Vanvitelli Station house over 200 works of art by some of the 100 best-known contemporary artists along with works of art by Michelangelo Pistoletto, Rebecca Horn, Ilya and Emilia Kabakov, William Kentridge, Katharina Sieverding, Sol LeWitt and Shirin Neshat to name a few. 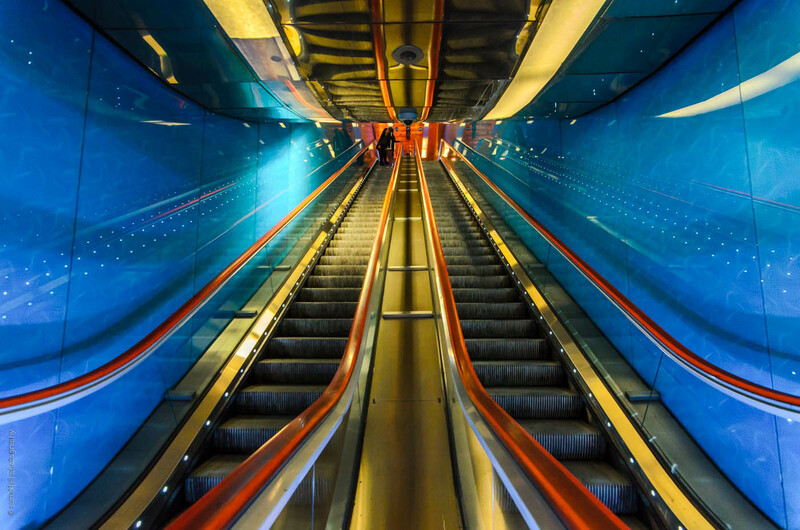 “Two sides of the same coin” – this idiom is adept to describe the juxtaposition of the lavish and contemporary underground to the unkempt city (Naples) aboveground. While aboveground, the transport system is mostly in shambles, with traffic snarls and streets crowded with locals who have found comfort in the mess, they are still very proud of the new transformation of the city. 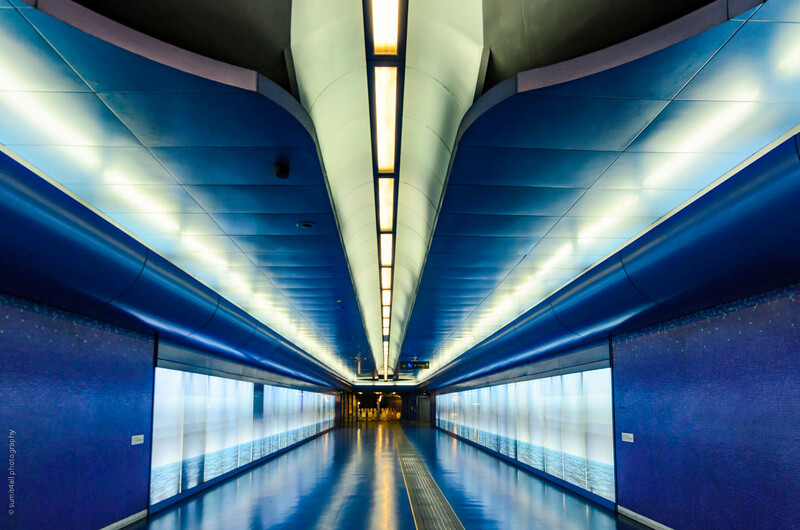 Unlike the graffiti-strewn derelict-looking cityscape, the underground remains untarnished and free from vandalism, as you can see in this photo essay. It is a slow but sure shift in a collective mentality. A change that can be seen even aboveground, moving at a snail’s pace, but taking place nevertheless. 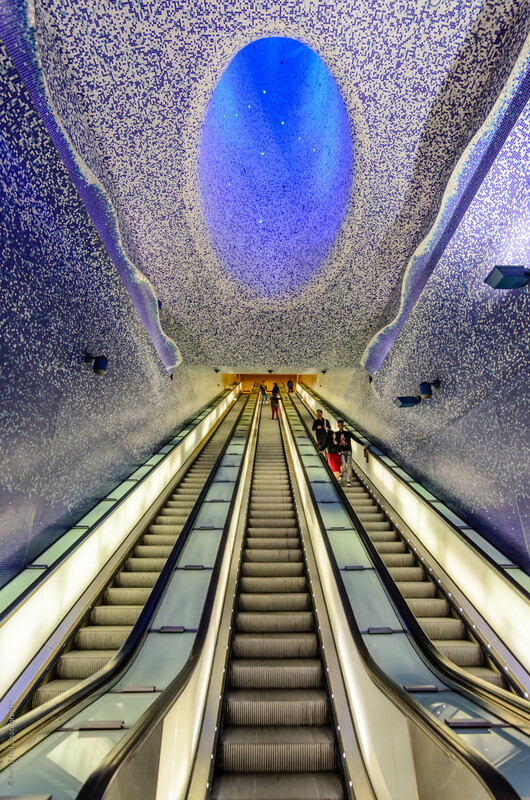 The Naples Metro is the perfect example of contrast visible in the same city. It is the paradox presenting two elements of life – the beautiful and the ugly, the organised and the chaotic, existing side by side. Neither is better or bad, for both above and below the ground is Naples. Both add character to the city that so beautifully merges to form one unique entity – Naples. It is this identity of each city that I like to capture and depict in my photographs. 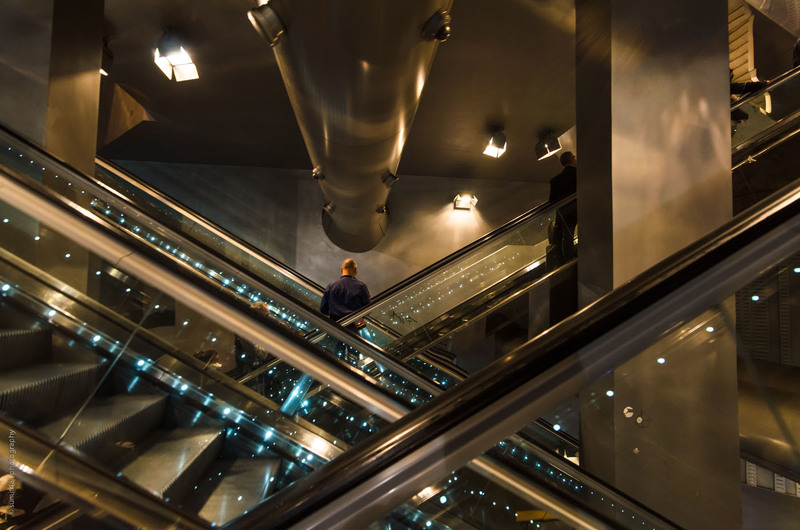 Cities, just like people, are more than what first impressions seem to depict. And what I have learned is that if we are willing to spend the time and look deeper – whether behind a person or into a city, we find a unique identity for both – an identity which has formed and moulded over the decades into what it is today.